Wriphe belongs to the living, and he who lives must be prepared for changes. 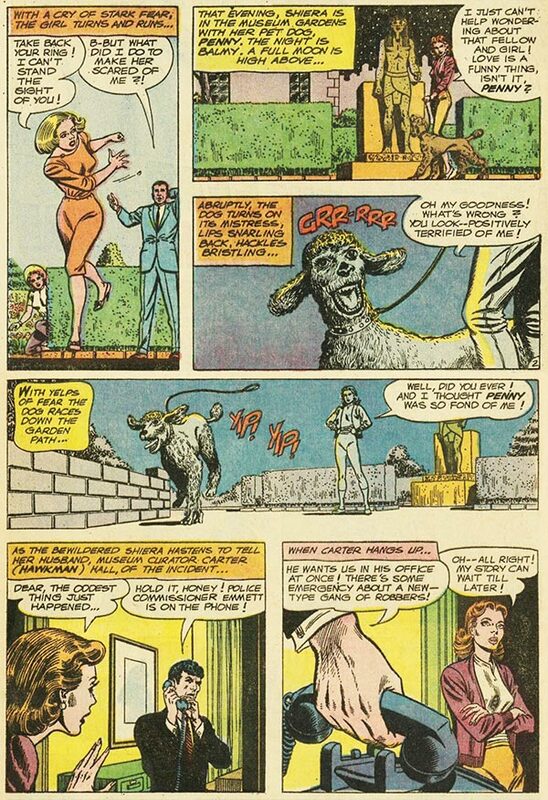 Hawkgirl had an apricot standard poodle! In case it's not obvious here, the source of Penny's sudden fear is that Egyptian statue in the museum gardens. That sort of thing happened a lot in the Silver Age. She named her poodle "Penny"? No wonder it ran away. "Oh -- all right!" Shiera doesn't seem to care very much about her run away dog, does she? Bad Hawkgirl, bad! Penny never appears again, not in this comic or any other. THAT'S NOT RESPONSIBLE PET OWNERSHIP! Do yourself a favor, Hawkgirl. Next time, get a goldfish. If you had two dice and I gave you four more, how many would you have? Afterwards, if I gave you six more dice, how many would you end up with?